People who have used the 3M (Quest) Edge noise dosimeters rave about them: No cables, just three ounces, 40-hour runtime, two virtual dosimeters for OSHA limits, and models for general service and harsh environments. 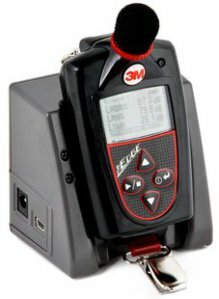 Recently, 3M added a third virtual dosimeter to the Edge eg5 intrinsically safe models. So now, you can set up OSHA Hearing Conservation (HC) and Permissible Exposure Limits (PELs), plus ACGIH setpoints. If you install DMS and enable the third virtual dosimeter, you can’t download data into QSP II anymore. There’s a download file checksum in QSP II that fails when the third dosimeter is enabled, so it considers the data invalid. If you want to go back to QSP II, reload the settings for the dosimeter from QSP II and disable the third dosimeter. Make sure you’re running the latest version of Detection Management Software. I’d tried setting up a third dosimeter on a unit, and tried to save configuration settings with the setpoints in this order: OSHA HC, OSHA PEL, ad ACGIH. The settings wouldn’t save, and the software kept changing the ACGIH exchange rate from 3 to 5. I changed the order of the setpoints: OSHA HC, ACGIH, and OSHA PEL, and the exchange rate saved correctly. 3M has reported to have fixed the software with the latest patch, so be sure you’re running the latest version. One Edge eg5 noise dosimeter kit: $80/day, $270/week. Five-Pack Edge eg5 noise dosimeter kit: $260/day, $850/week. Need dosimeters for a month or longer? Call for our competitive long-term rental rates.